Checking Out the IBM 5150 I Got for Christmas! Bec got me an IBM 5150 PC for Christmas! In this video, I swap out the MDA video adapter for a VGA adapter and test it out. Since I don’t have an MDA monitor, I install an 8-bit Western Digital PVGA1A-JK based video card. (Thanks to user KD5VMF for his/her knowledge of the video card dip switches posted here on the Vintage Computer Forum: http://www.vcfed.org/forum/archive/in…) Also of note and not shown in the video is that I had to set SW1 switches 5 and 6 to “On” in order for the VGA card to work. I also discover the computer has an NEC D8088D CPU installed instead of the stock Intel CPU. This is odd because the two are functionally identical. The original CPU may have went bad but I guess we’ll never know. I boot the machine with IBM DOS 3.21 and IBM DOS 3.3. The IBM-branded “A:” drive works. The “B:” drive does not. An attempted repair video will be forthcoming. Just in case anyone needs it, here is a driver floppy disk image for the Network Anywhere 10/100 PCI Ethernet Adapter. The original floppy I made this from came with a card I bought on a sweltering July night in 2003 at my local Wal-Mart to satisfy some crazed nerd project I was working on. You will need 7-Zip to extract the image and something like WinImage to write it to disk. There’s a scary threat sweeping the computing world known as ransomware. Ransomware is a type of harmful software that makes your data unreadable unless you pay the creator money to make it readable again. And, unlike the threats of yesteryear (i.e. viruses, Trojans, rootkits, etc. ), it is extremely unlikely that any antivirus software can help you recover your data because it is encrypted in such a way that even a supercomputer can’t easily descramble it. Even worse, most users don’t do anything wrong to get infected. Clever hackers have figured out how to infect machines by infecting perfectly reputable websites with malware that installs the ransomware just from visiting. When users are infected with ransomware, they are normally greeted with a sort of virtual ransom note that explains how much it will cost to get their data back, how long they have to pay up, and where to send the money. If you don’t pay, the bad guys delete the key and your data is lost forever because the key is nearly impossible to guess. If you’re wondering why law enforcement can’t just trace the accounts where the ransom money gets deposited, it’s because payment must be made in Bitcoin, which is an odd currency born on the Internet that gets traded and exchanged for actual monies on some of the darkest corners of the Internet. This ensures there is no paper trail to follow. Most ransomware makers will decrypt your files if you pay as instructed, but there’s absolutely no guarantee your infector will follow through. The only thing you can do to protect yourself is back up your important files often onto something that can’t be changed by ransomware if it finds its way onto your computer. Flash drives are great because you can make the backup and disconnect it from the machine. Even better is the old-school method of burning your important files to a CD or DVD because the ransomware can’t change the data because optical discs are read-only once burned. Hopefully, the antivirus makers will figure out how to neutralize ransomware, but for now, backup often or literally pay for it later. Keep in mind that the table name (in this case tblpr_users) should be adjusted to whatever your table prefix is. Also, the password string (the first parameter in the SHA2 function) needs to be changed to whatever your password is. Disable Wi-Fi Assist on Your iPhone to Avoid Excess Data Charges! Here’s a likely scenario a lot of unsuspecting users fall prey to. 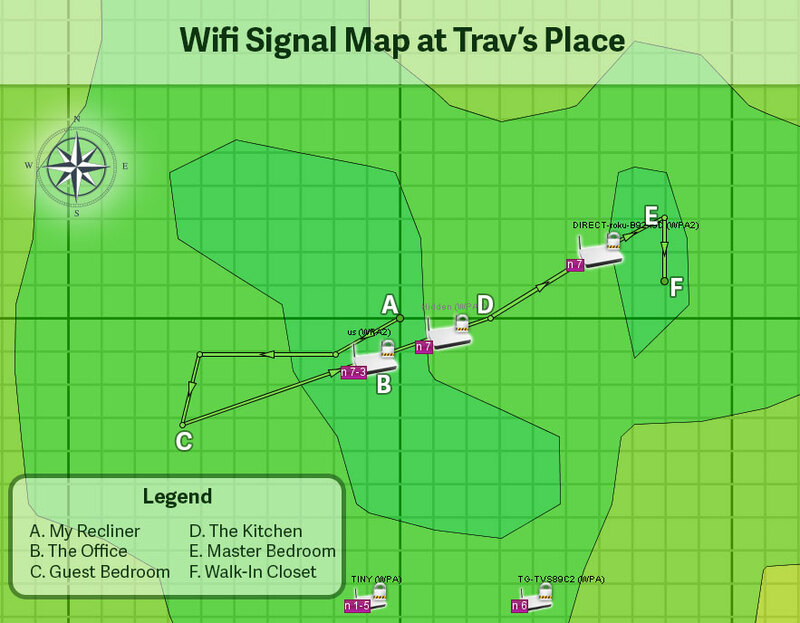 Let’s say you’re streaming your favorite show from Netflix while you’re connected to wi-fi at your house. You need to go the basement for something, carrying your happily streaming phone with you. 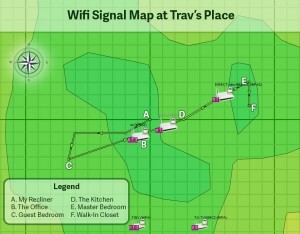 The iPhone detects that your wi-fi signal has suddenly dropped to one bar because your router is upstairs on the other side of the house. To keep you from missing precious seconds of your show, it switches from wi-fi to cellular data without giving you any notice. Since you probably don’t have unlimited cellular data, you end up paying big data overage fees, especially if this scenario happens a few times a month (or worse, a few times a day). The long answer with details: Back in April, I bought a PreSonus AudioBox USB 2×2 audio interface so I could use a Shure SM-58 microphone to record instructional videos. I’ve tried many other mics, including a Blue Yeti USB, and while several sounded good, I could never get the level of noise rejection that I wanted. My mouse and keyboard clicks were always too loud and I have a noisy heat pump. No matter what I did with gain, levels, and pop filters, there was always too much unwanted background noise. The SM-58 has excellent noise rejection and had a nice rich sound for spoken-word content like I would be producing. I unplugged and plugged back in the unit in the same USB port. I unplugged and plugged back in different USB ports, including ones integrated on my motherboard and others on a Silverstone PCI-E USB 3.0 card hooked to the machine. No difference. I rebooted many times in different configurations. I made sure all peripherals plugged into my machine were on the same AC circuit (to make sure it wasn’t a ground-loop problem). I bought a new gold-plated, shielded USB cable from Monoprice. This helped actually helped a little, but not enough. I rerouted every cable going into my machine such that the Audiobox USB cable had no other cables within 6″ of it. Additionally, I made sure the monitor headphones and mic cables were straight and not crossing one another in any way. I was fed up and tempted to order a more expensive unit from a different company. In a last ditch effort, I plugged in a cheap USB powered power squid hub into one of the integrated USB ports on my motherboard, then plugged the Audiobox One into that. To my sheer amazement and delight, that worked like a charm! Even with the gain all the way up on my mic channel, no noise whatsoever. And playback through the unit into the monitor headphones is crisp and clear. None of the aforementioned electrical noise! My only guess is that the unit doesn’t do well if there isn’t enough power coming from the USB port. Instead of not working at all, it makes due and produces a terrible signal. I didn’t try a powered USB hub sooner because back in the day, the conventional wisdom was that any USB audio gear should be plugged directly into the motherboard. It’s 2015, so I guess that isn’t always the case anymore. For what it’s worth, I’m not going to plug anything else into the powered hub for fear that it may mess up the sweet perfection of my current audio signal! I have created a new domain, jerry.education, as a place to aggregate all of my educational resources. I feel it will help more people find my digital literacy resources than just hosting them here, as the URL itself is rather self-descriptive. I am going to leave the Desktop Publishing Projects page here for legacy purposes, but going forward, new stuff will be posted on jerry.education. I’m really excited about the Windows Technical Preview (aka Windows 10) that was released today. I decided to forgo a virtual machine and dual-boot it on my laptop running Windows 8.1. My laptop is an Asus G55VW and the existing Windows 8.1 installation being setup in UEFI (with the requisite GPT partition scheme). I downloaded the image and made a flash drive using the Windows 7 USB Download Tool, but when I booted from the drive and tried to install, I got an error message: “Windows cannot be installed to this disk. The selected disk is not of the GPT partition style” when I clicked on the empty partition I wanted to install to. Plug a flash drive into a USB port on your machine. Download Rufus. Rufus is a small utility that will put the ISO files on a flash drive you can use to boot from and install Windows. While there are other utilities that do this, Rufus allows you to specifically setup the flash drive as a GPT boot device. This will allow you to install Windows Technical Preview on a GPT drive, side-by-side with Windows 7/8/8.1. Set the Device dropdown to the flash drive you want to turn into a technical preview installer. 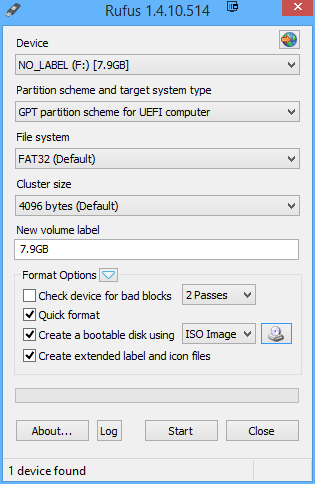 Set the Partition scheme and target system type dropdown to GPT partition scheme for UEFI computer. Click the little disc icon next to the ISO image drop down and point to the Technical Preview ISO you downloaded in step 1. Click Start and wait until the status says DONE. You should now be able to boot from the USB drive and install the 64 bit Technical Preview in dual boot on most machines that boot using UEFI and have a hard disk with GPT. I’ll leave it to you to find out how to create a empty partition to use for the installation, but at least now you will have a UEFI flash drive installer.